This week’s book is from author Andrew Hicks, who appears to be an interesting sort of cove. 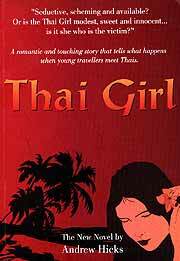 An ex UK corporate lawyer and university lecturer, Thai Girl (TYS Books, 2004, ISBN 974-92003-4-9) is his first novel, with his characters young backpackers, something Andrew Hicks is not. In fact Hicks is honest enough to say that he wanted to challenge Alec Garland’s bestseller, The Beach, in writing about young backpackers. The novel revolves around the exploits of a young man on his first trip to Thailand and its effect upon him. It begins with his introduction to the ‘scene’, beginning with a go-go in Bangkok’s Patpong, where the young Englishman has never seen anything in his life like the flesh display put on by the uninterested chrome pole hugging females. Undergraduate revues at English universities not being quite as titillating, if you’ll pardon the pun. From there he finds the other flesh pit of Nana Plaza, which for some inexplicable reason Hicks refers to in the book as Naga Plaza. I have always believed that if you want to introduce some ‘realism’ to the manuscript, then use the ‘real’ name, especially place names. We know where you are at, author Hicks! Be brave and give the place its correct name! The next port of call for the tyro Thailand traveller is Ban Phe, the jumping off point for Koh Samet. There, Ben’s English girlfriend Emma and he split up, with irreconcilable differences. He has, by this stage met some seasoned backpackers, with most availing themselves of the commodities that come cheap in this country, going the full gamut from A to A - alcohol and available women. By now the reader has a good insight into Ben’s character, who is the archetypal immature young university graduate and author Hicks does well in showing just how crass and self centered young men can be. The other main players are Fon, a young Thai girl and Emma, his English university girlfriend. The other characters, to me at least, were a little superfluous, as they did not lend enough to the story to keep bringing them back, or in the case of the middle aged businessman in Bangkok, being used only to provide a kind of Lonely Planet Guide to the flesh pits for lonely males. The book does show how Thailand provides the maturation of Emma, and just how much ‘older’ than Ben is the young Thai girl, Fon. Each player has his or her own agenda, and Hicks has done very well in his pen-sketch of the Thai psyche of the Isaan girl, who can be both open and closed, loving and stand-offish, all at the same time. Same-same but different, as any resident here can tell you! The story reminded me of the book Billy Liar, written by Keith Waterhouse in 1959 (and a movie released in 1963) - but without the inimitable Waterhouse humour. The endings of the two books are very similar. Young immature British males have not changed much in the intervening 40 years! Distributed by Asia Books it has an RRP of B. 395. A good first book. When this album was released in 1969, it was to change the whole face of rock music as it was then known. 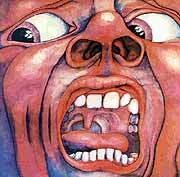 In ‘The Court Of The Crimson King’ by King Crimson almost single handedly invented what was to become known as progressive rock, and with first track ’21st Century Schizoid Man’ had a fair hand at putting heavy metal music on the map. The strange thing is that ‘In The Court Of The Crimson King’ started life as a bit of a curiosity. I bet that half of the first lot of people to buy this album did so due to its cover alone, relying upon the intuition that anybody who would put such a face to their music, inevitably had to have quite some spirit of adventure. They were - of course - correct. King Crimson had a very auspicious debut year. Their first few rehearsals were held in January; their debut live performance was at the Speakeasy in London, April 9th, followed by a support slot at the Rolling Stones free concert in Hyde Park in July. Their debut album was released to great critical acclaim in October and reached #5 in the British Charts and #28 in the American Billboard. Today, after over 33 years, King Crimson is still very active and highly regarded, producing some of the most creative music in existence, just as they always have, under the collective banner of King Crimson and always led by main man Robert Fripp, who is now in his seventieth decade. The man in black still commands the stage from his seat at the back of the stage. Grim faced he plays his guitar one minute with the violence of an axe, the next with the gentleness of a feather, but always with determined concentration. There have been sixteen studio albums, every one reaching the upper regions of the charts all over the world, countless live albums, and compilations. Twenty-one people have been in the recordings and live works ranks (not counting guest musicians). They even had a hit single with ‘Catfood’ back in 1970. As the lineup has changed many have gone on to more fame and fortune. From the first lineup vocalist Greg Lake went on to form super group ‘Emerson, Lake and Palmer’. Ian McDonald was an original member of ‘Foreigner’, whilst Mike Giles went on to be one of the most respected drummers in the session world. Other groups came and went, but Robert Fripp just carried on in his own sweet way, oblivious to anything that does not concern him, demanding only perfection from his fellow musicians. During its lifespan King Crimson has gone from this lineup, which had vocals with the basic trio of drums, bass, and guitar, with additional saxophone, flute, keyboards, mellotrone, synthesizer, and harmonium, to today’s more basic lineup of vocals with two guitars, bass, and drums. That’s quite unusual in itself, as bands usually add instruments rather than strip them away. The album opens up with the brutal ’21st Century Schizoid Man’, which was actually this dog’s first introduction to King Crimson, as this track was released on a compilation album by Island Records to showcase all the artists on their roster. This was an album set called ‘Nice Enough To Eat’, containing twelve tracks from various bands on the label, all for the price of fourteen shillings and sixpence (about forty five baht), just within range of this at the time 13-year old dog’s pocket money. After the loud entrance of the ‘Schizoid Man’ (although it became a bit of an albatross round the old King Crimson neck, it was only dusted down and rehashed as an encore number by Robert Fripp last year), you are swept away by four more rock epics. The shortest called ‘I Talk To The Wind’ clocks in at just over six minutes, while ‘Moonchild’ - with all its beeps, boops, and whistles still intact - comes in at a massive 12 minutes. Hardly surprising then that Crimson was never really considered a singles band. Musical standouts, if you had to pick some from this faultless album, would have to be (apart from all of Schizoid) Ian McDonald’s flute playing in ‘I Talk To The Wind’, Greg Lake’s singing in ‘Epitaph’, Ian McDonald’s groundbreaking keyboard work in ‘Moonchild’, and Robert Fripp’s simply staggering guitar work in final song ‘The Court Of The Crimson King’. If you think that it is only studio trickery that lets them play this immaculate music, think again. The proof is the live album ‘Epitaph’ recorded on this lineup’s tour of America at the Filmore East. The encore recording of the band rollicking through ‘Mars’ from Holzst’s ‘Planet Suite’ has to be heard to be believed.